Mamluk patrons commissioned lamps to hang in mosques and other public places. In Islamic tradition they are both symbolic and practical. The Arabic inscription reads: ‘Glory to our Lord the sultan, the king, the wise, the just, the warrior’. Lamps were fashionable collectors’ pieces in orientalist interiors in Europe from around 1860, particularly in smoking rooms. 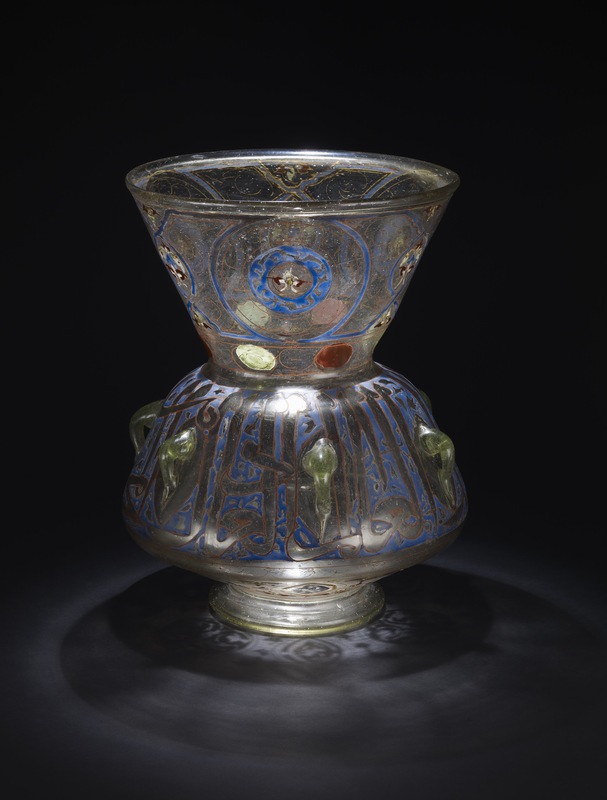 Glass mosque-lamp; enamelled in blue with red and gilding; round the upper part are three circular designs with flower in the centre; between, interlacing lines forming shaped panels containing flowers; on the body, a band inscription in tall Arabic letters, divided by six projecting loops, from which the lamp was suspended; on the under part of the body, three circular and three oval panels of ornament. Commentary: The loop handles of this lamp are designed to that it can be hung in the sanctuary of a mosque (an example in the V&A ((inv. no. 1056-1869)) still has its original metal hanging chains from c 1340). Lamps of this type are often painted with inscriptions from the Qur'an, or with the name or arms of the sultan or other official who dedicated them. This lamp is made in the name of an unknown sultan, as the inscription translates: 'Glory to our Lord the sultan, the king, the wise, the just, the warrior'. Most of the surviving lamps have been found in the mosques of Jerusalem and Damascus, as well as in Konya and the Yemen. They became desirable collector's pieces in 19th century Europe, particularly amongst the Rothschild family. Solomon de Rothschild owned two examples now in the Louvre (inv. nos. OA 7568 & OA 7567) and another was acquired and exhibited by Baron Gustave Rothschild at a Paris exhibition in 1869, an inexact copy of which by Philippe Joseph-Brocard, dated 1867, is now in the British Museum (reg. no. 1902,1118.1). Dora Thornton, 'A Rothschild Renaissance: Treasures from the Waddesdon Bequest', British Museum, London, 2015, pp.104-107.